Like much of the midwest, we have been snowed in a lot over the last week. Really, all things considered, Alan has been pretty good. The roughest day was Sunday because that was the day we actually had dense, driving snow all day and we didn't go anywhere. Starting on Monday we have been back to at least going out to lunch and then going sledding at least once a day. We back to a big hill that is common ground. 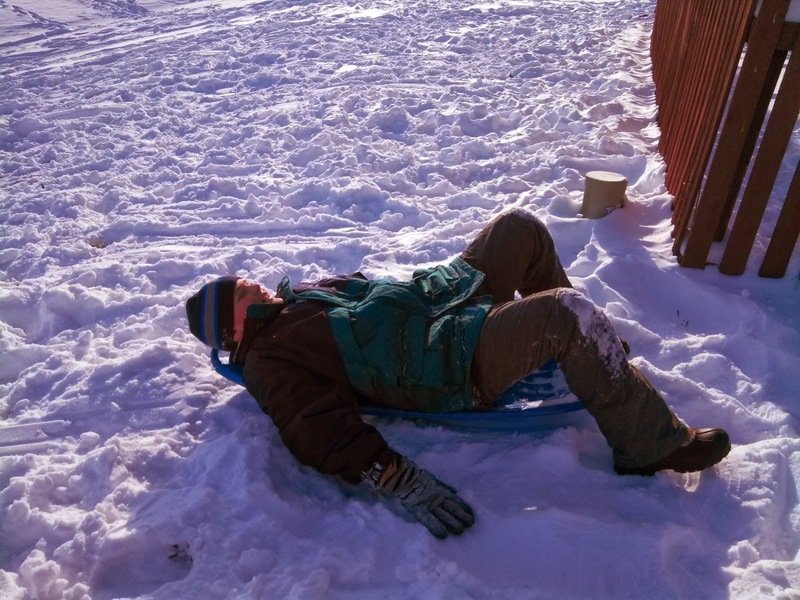 Alan loves sledding and for the most part can do it independently (thank goodness as one or two trips up that hill would be enough to give this out of shape 40+ lady cardiac arrest!) but it is yet another time when I feel his differences keenly. After all, how many parents of 15 year olds are sitting outside watching them sled?? I could probably watch from inside the house, but by the time I would realize there is a crisis, get my snow gear on and get out to intervene, things would probably have reached a crisis point. Naturally, his favorite way to sled is headfirst on his back. Mostly I just have to explain to the other kids why Alan is ignoring them. (After saying "Hi!" five times in a minute wouldn't you think a kid would give up?) 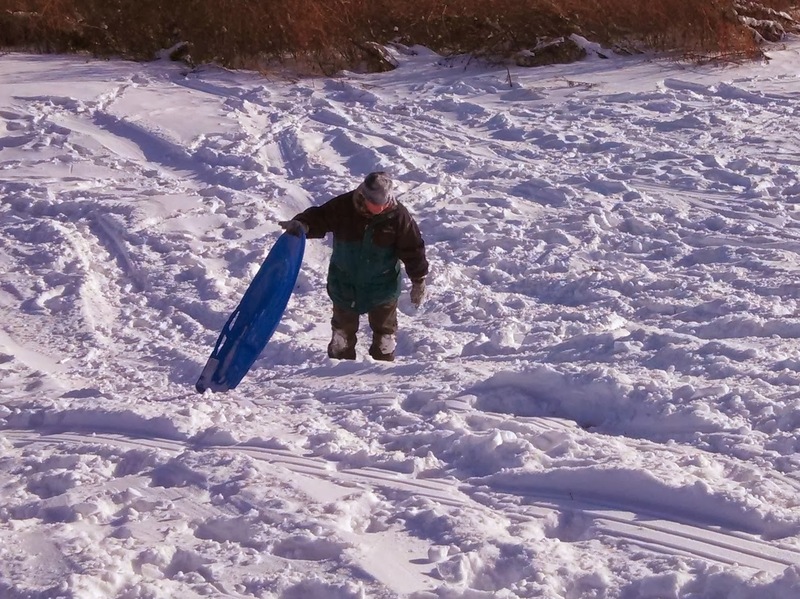 Occasionally I also have to remind Alan that he can't sit at the bottom of the hill and finish reciting his latest script when the other kids want to sled. His OCD and need to finish the scripting seems to be worse, but that might be due to the fact that he has now been off school for three full weeks and mom just can't do structure like school can! On the bright side, cold weather brings out Alan's cuddly side. He is really quite a "snuggle-bug". Alan's nickname since he was a baby has been "bug". His real name (like his middle name, Alan) sounds dumb with a "-y" at the end so that has never been a nickname for him. And hence, he has always been "Bug". When the weather is cold, he likes to remind us frequently how much he likes to snuggle. 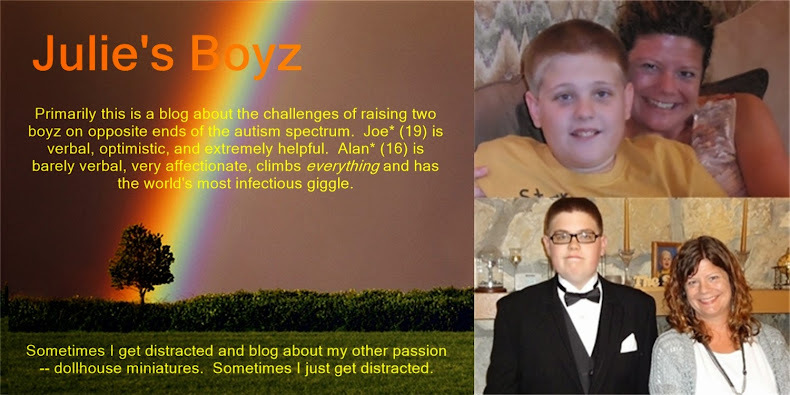 The last picture (taken by Joe) was done at my request. He made sure to take it with my camera (instead of his new smart phone camera) because "snuggling like that is a baby thing to do" (according to Joe). Huh. He is still struggling to understand what is and isn't age appropriate. I told him that there was nothing wrong with snuggling but he wasn't buying it. Oh well. On the bright side, at least one of my boyz still likes to snuggle! Three weeks out of his program and you are still smiling. You are my hero. I would be pulling my hair out. I am so glad I have several children that still think it is ok to snuggle. I hope it never changes. I love it! What a long break from school! At least all that snow has some entertainment with it and sledding. I grew up in up state NY with lake effect snow. I moved to the south when I was 14. But I remember it all well. :) Many blessings you your day and life with your wonderful family!